Amazon is wreaking havoc on the retail space, and technician Todd Gordon says the charts are showing there’s actually no relief in sight for the group. News on Monday that Amazon was rolling out its own “Geek Squad” similar to that of Best Buy sent shares of the electronics company tanking 6 percent, while Costco also fell more than 1 percent on a downgrade by BMO, which saw the Amazon-Whole Foods deal as a threat to the retailer. And unfortunately, the charts don’t look any better for the retail space. 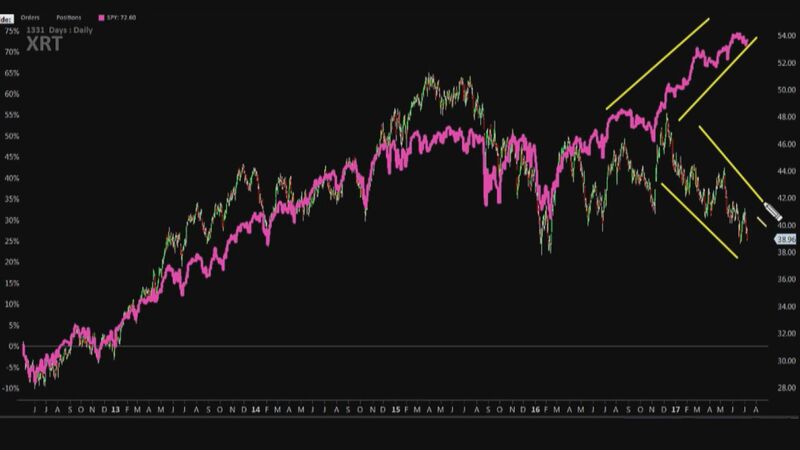 Monday on CNBC’s “Trading Nation,” Gordon compared a chart of the S&P 500 ETF (SPY) and XRT, the ETF that tracks retail stocks. Gordon is referring more specifically to what he sees as a “shelf of support” at around the $38 region. 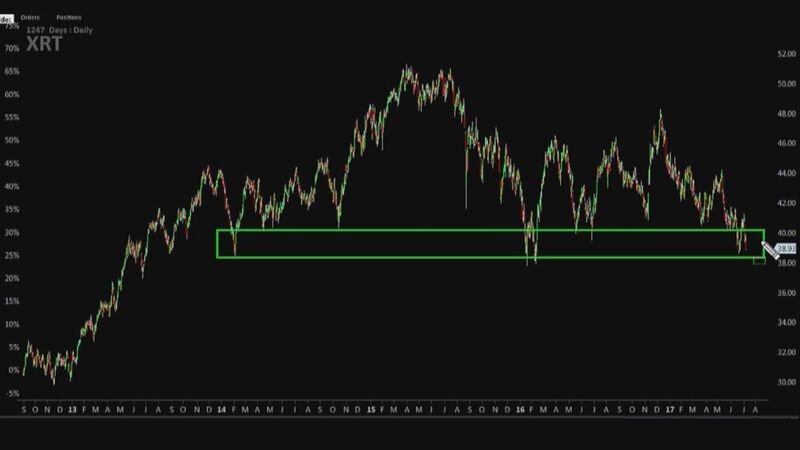 He noted that over the past three years, each time the XRT has fallen to this $38 level it found buyers. But Gordon believes that this time XRT could actually break below $38 to hit lows unseen since 2013. To trade XRT, Gordon wants to buy the August monthly 39-strike put and pair that with the sale of the August 37-strike put for a total of 65 cents, or $65 paid per options spread. Based on Gordon’s levels, if XRT were to close below $37 on August 18, the expiration date, then he would make $135 on the trade, essentially more than doubling his money. But if XRT were to close above $38.35, then Gordon would start to lose money on the trade, facing a maximum loss of $65, the premium he paid, if XRT closed above $39. “If the 65 cents in premium outlay gets cut in half, it goes down to about 32 cents or 33 cents, let’s cut the trade, contain the risk and move on,” he said. Retail is currently down 11 percent year to date.